According to the American Dental Hygienists’ Association (ADHA), October is National Dental Hygiene Month. With the candy-filled holiday of All Hollow’s Eve quickly approaching, now is the perfect time to brush up on the basics and importance of dental hygiene. Dr. Sands, as well as the ADHA, recommends the “daily four” to help everyone remember the key components of oral health. An easy way to remember the basics of good toothbrushing habits is the “magic number” two. You should brush for two minutes two times a day to prevent cavities, gingivitis, and the buildup of plaque and tartar. Check your toothbrush for frayed bristles, and be sure to replace your toothbrush every few months. Place the bristles at a 45-degree angle along the gumline so that they are touching the tooth surface as well as the gums. Gently brush the outer surfaces of two to three teeth at a time using a gentle circular motion, and continue until all outer surfaces are clean. Using the same motion and positioning, clean all inner surfaces of the teeth. Tilt the brush vertically and use the top half of the bristles to clean behind the front teeth; turn it upside down to clean behind the bottom teeth. Use a back-and-forth motion to clean all the biting surfaces of the teeth. Brush your tongue thoroughly to eliminate odor-causing bacteria. Gingivitis begins at the gumline and between the teeth. Flossing daily will remove the biofilm, tartar, and food particles from this area that can lead to gingivitis and that are sometimes impossible to reach with a toothbrush. It does not matter what type of floss you use or where in your mouth you begin, as long as you floss between each tooth and behind your very back teeth each day. Wind: Wind 18 inches of floss around middle fingers of each hand. Pinch floss between thumbs and index fingers, leaving a one-inch to two-inch length in between. Use thumbs to direct floss between upper teeth. Guide: Keep a one-inch to two-inch length of floss taut between the fingers. Use the index fingers to guide the floss between contacts of the lower teeth. Glide: Gently glide the floss between the teeth by using a zig-zag motion. DO NOT SNAP FLOSS BETWEEN YOUR TEETH. Contour floss around the side of the tooth. Slide: Slide floss up and down against the side of each tooth and under the gumline. Floss each tooth thoroughly with a clean section of floss. The teeth contribute to only half of the equation for overall oral health. 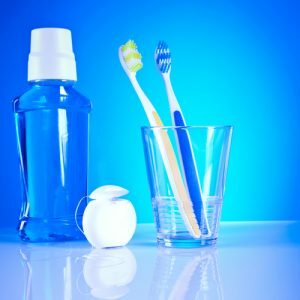 Clinical studies have proven that rinsing twice daily with an antimicrobial mouthwash can significantly reduce bacteria in the mouth and therefore decrease plaque and tartar build-up on the teeth. Mouthwash will clean areas of the mouth that neither brushing nor flossing can. This tip is easy for anyone to follow, as long as you consider what you are chewing. Chewing regularly will stimulate the salivary glands, which moistens the mouth to help rinse away bacteria. However, chewing on food and beverages high in sugar or acid very often or throughout the day will encourage bacteria production and decrease oral pH to an unsafe level. Over time, this can cause demineralization that can weaken enamel and lead to decay. Some studies have shown that chewing sugar-free gum can provide a slight but noticeable reduction in the presence of plaque. You should always avoid gum that contains sugar, though, since this will have the opposite effect. As you commit to the “daily four,” you will be sure to see a noticeable improvement in the look and feel of your teeth as well as your overall oral health. This entry was posted on Wednesday, October 11th, 2017 at 4:06 pm	and is filed under Dental Hygiene Month. You can follow any responses to this entry through the RSS 2.0 feed. Both comments and pings are currently closed.